Anderson is revered for his grand stage meditations on the American man (“Boogie Nights,” 3There Will Be Blood,” 3The Master”). But here, and perhaps to the dismay of some of his fans, he both narrows and redirects his gaze elsewhere to a single couture house in 1950s London and the very particular man behind the designs, Reynolds Woodcock. The great Daniel Day-Lewis, in what may be his final film performance, plays Reynolds as a soft-spoken dandy whose precise rules and polished look thinly veil his volatile artist’s temperament. We’ve certainly seen this kind of thing before — a celebrated artist who literally cannot stomach anything outside of his routine from ugliness to general unpleasantries and everything in between — but it is something special and distinct in the hands of Day-Lewis, who is perhaps the only working actor perfect and exacting enough to play someone so perfect and exacting. Reynolds’ nature is just one of the reasons why he’s sailed past middle age and has not only never married but also will proudly tell a woman on a first date that he is a “confirmed” and “incurable” bachelor. The audience sees Reynolds and his sister Cyril (Lesley Manville), who runs the business side of the House of Woodcock, dispose of a pretty woman early on for the crime of wanting his attention (and disrupting breakfast by offering him an unwanted pastry). Thus we’re not expecting anything very different when he takes a shine to Alma (Vicky Krieps), a waitress at a restaurant in the country whom he teases and flirts with by ordering an excessively large breakfast spread for just himself and grinning widely at his next prey. Alma, who seems shy and awkward in her lanky body, bumping into chairs and blushing at the sight of Reynolds, smiles and plays along and gladly accepts his dinner invitation, and, soon one to come back to London to model for him. But this is not “Funny Face” or “My Fair Lady” or “Pretty Woman” or any number of “ugly” duckling turns to swan with the help of a hairbrush/expensive clothes/great man stories. It’s not even really about fashion (although Mark Bridges costumes are indeed sumptuous). It’s a story of relationships and power. Alma, we come to discover, is not like the other girls even if she fits the mold (Cyril tells her plainly that she has the perfect shape — “he likes them with a little belly”). She has a bite and will push back on some things and concede on others. “He’s too fussy,” she says defiantly after a disastrous breakfast where Reynolds storms off because she’s buttering her toast too loudly, only later to succumb to the library silence he prefers in the morning. Ultimately, it seems, Alma is testing the waters in hopes of carving out her own unique relationship with Reynolds. Why Alma loves this petulant genius is something the film doesn’t really make any effort to explain. It’s just a fact, and an occasionally infuriating one. This takes a somewhat surreal twist halfway through, but it’s intriguing enough to carry you to the end of the film. Even in the unusually confined setting, Anderson gives moments and characters room to breathe in this silky smooth film that lulls you in before taking you on the unexpected ride of the third act. Giving one of the most beautifully subtle performances of the year, Krieps more than holds her own against Day-Lewis, and in some cases even goes so far as to outshine him — a fitting parallel to her character. Manville, too, is superb as Cyril — a Mrs. Danvers-type, without the sinister angle. 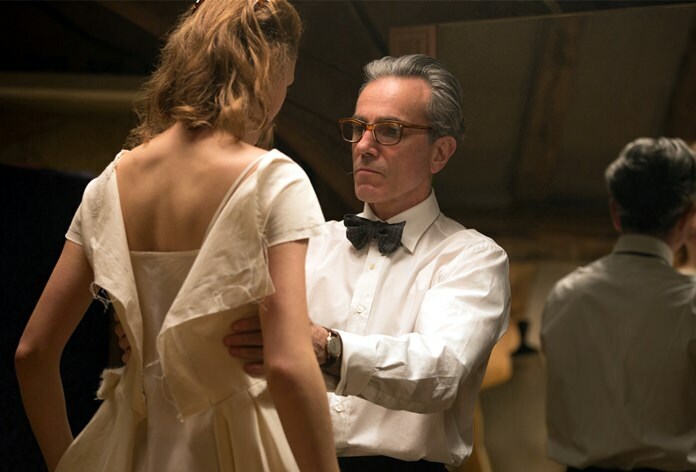 Like all of Anderson’s efforts, “Phantom Thread” is beautiful and intriguing, but it’s also a film that is not unlike its central character: easy to respect and admire, and nearly impossible to fully love. “Phantom Thread,” a Focus Features release, is rated R by the Motion Picture Association of America for “language.” Running time: 130 minutes. Three stars out of four.